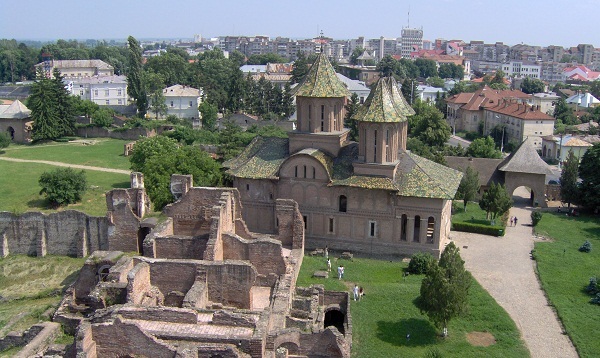 This week’s Romanian city is Targoviste, the former Wallachian capital and Royal Court located 80 km from the current Romanian capital Bucharest. It is a city where history springs from every corner, and its closeness to Bucharest makes it a great week-end escape destination. Located on the right bank of Ialomita River in the county of Dambovita, Targoviste was first mentioned in 1396 in Johannes Schiltberger’s “Travel Accounts”. It is a city rich in historical places and events. It was the capital of the Wallachian voivodship during the reign of Mircea cel Batran. Later on, the capital was moved to Bucharest during the time of Constantin Brancoveanu, so Targoviste lost its importance and the number of inhabitants decreased. However, the city still stands as a gate of time, a sneakpeak to the most important moments in the Romanian history. Great battles took place there, such as the ones against the Ottoman Empire, lead by Mihai Viteazu and Starina Novak. Being an old crossroad of historical trading routes, the city is now a road and rail junction, easily to be approached from all sides. Once there, the traveler has a lot of sightseeing to do. Firstly, go towards the Chindia Tower, the symbol of Targoviste, added to the city by Vlad Tepes - also known as Dracula. The National Museum Complex, also known as the Royal Court, is an ancient architectural ensemble, which was for more than three centuries the residence and the royal court, and which remains the best kept Romanian monumental art. The National Museum Complex houses the Great Royal Church, Chindia Tower, The Royal Palace, St. Friday Church and Balasa House, as well as all the other museums such as the History Museum (an architectural monument raised in 1902 that keeps collections of great archaeological and historical value which reflect the evolution of the city and of the entire county). The Museum of Printing and Old Romanian Books is also a must see if one is interested to find out more about the Romanian culture and its written art. This is the house of the Stolnic Constantin Cantacuzino, built in the second half of the 17th century, being the first typographical centre with large spreading inside and outside the country. The Museum of Dambovita Writers is another famous place where one can find old Romanian manuscripts and documents, well kept genuine writings of the Romanian poets, non-religious and religious books and collections of old-century objects. The "Vasile Blendea" Museum, a residence characteristic to the style of the 18th century, the "Stelea" Galleries, located in the former Museum of the city, the "Gheorghe Petrascu" House-Atelier and the "Gabriel Popescu" House-Atelier may also be interesting points on the map for the lovers of classical personal objects, photography, old style furniture, paintings, writings and mixed arts. Many archaeological collections and ethnographic pieces may be found in the historical monuments such as the House of Dobrescu, the village museum of Pietrosita or the museum of the town Moreni. To visit these, its better to rent a car, as they are located outside the city. For the seekers of old times' charm and for those in search of the pure and unspoiled Romanian traditions and ancient legends, Targoviste is the best city to go to. All restaurants and pubs are created in medieval style, serving mostly traditional recipes besides the well known international dishes. Hotels are also not hard to find as Targoviste is one of the tourist attractions in Romania.